Is My Maggotkin Army Any Good? Contagion Points? I am about to play in a local tournament, and I was wondering if my army was any good. I am a long time Nurgle player, but I am trying a new playstyle. Tell me what yall think... I call it Swift Contagion, it is a 2500pt Nurgle Rotbringers and Maggotkin army... 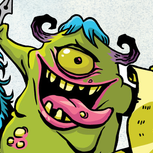 Leaders: The Glottkin Lord of Afflictions Lord of Plagues Lord of Blights Harbringer of Decay Gutrot Spume Units: 2 units of 3 nurglings 4 units of 5 PBK's 2 units of 2 Pusgoyle Blight Lords I am a bit confused on how contagion points work! 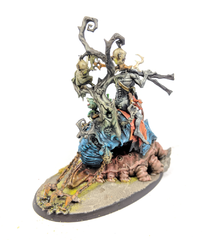 How many points is a feculent gnarlmaw or plague bearers? Do I have to spend points to summon them? What is the new contagion cycle? If y'all could answer these that would be great! Thank you so much! Please tell me how my army is! Here are some wips that I have on the table that I'm hoping to have done before the end of the year. Teaching seven classes this semester has really knocked out my hobby time! I've got a ton of work left to do on these guys, plus the numerous other Nurgle warriors and demons. To those Running LoA, what are you doing with the spare Pusgoyle? I picked up a box of Pusgoyle Blightlords and was planning to get a 2nd box to run a unit of 3 and a Lord of Afflictions. Then I realized they are priced as units of 2 in the player handbook and I don't want to short myself 110 points... I still want a LoA, mostly to use with Plague Drones for the extra attack but I'm having a hard time justifying a 2nd box at this point. So I am currently working in a rotbringers army. The battletome says you can take units from monsters of chaos as allies. However you can't take anything tzeench marked. 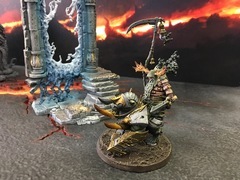 Im looking to use a mutalith vortex beast which has recently gotten the tzeench keyword but is still in the monsters of chaos faction which nurgle can ally with. 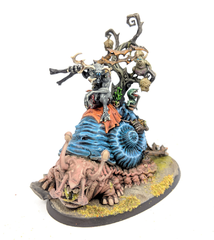 Would it be legal to take the mutalith in a nurgle army using ally points? Hello everyone! 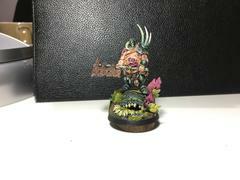 i am finally able thanks to my girlfriend to upload photos of my Nurgle force into TGA! Loved painting these minis, hope you like and enjoy, feel free to criticize and help me improving! Overall i chose the following scheme: white and infected-like skin, rusty weapons, green acid armour, heavy shades to emulate dirt and oil in the armour. yellow bubbon and red wounds. This is my Harbinger of Decay (FW Khazyk ) These are my Glottkins! mantained the same colour for all the army (hope u like it) Then here there is my converted Daemon Prince: My converted Plagueclaw (i hate gw model) And finally my 10 blightkings! Thx for your time! Nurgle's Newb - help me complete, you're my only hope! 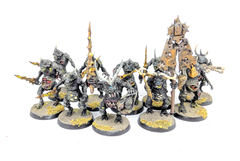 I've been working on my Nurgle Rotbringers army for awhile and the first batch of troops is basically finished (some small base work and detailing to be done) with only 5 days to go before the Holy Havok team tournament. I figured I would share the force here for those that might be interested with the the hope that it might inspire some ideas for folks. The current force is: The Glottkin Bloab Rotspawn Chaos Warshrine (Kitbashed) Harbinger of Decay (Kitbashed) 15 Putrid Blight Kings 30 Chaos Warriors Hellcannon I have another Hellcannon on the table that just needs its highlighting and glow effects that should be done by the end of the week. I have a number of other units I'll be adding here as I finish them. Sorry about the bad lighting on these photos; I'll try to get some better ones up later for those interested. Enjoy! hello everyone! posting here cause i have a big issue: follow the competitiveness or following my hobby (painting)? 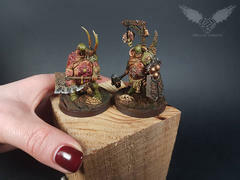 i love nurgle in all his forms, i swear it is even quite as good as khorne or other factions, but this maybe is a dream. nurgle is resilient but lacks damage. my actual force (i own an half of it) is based on pure mortals, and on the plaguetouched warband: resilience is the key of success, with tons of warriors (28) and blightkings (14), plus some more mobile (chariot) and utility stuffs, like bloab and harbinger. however i find really frustrating painting warriors, marauders and chariots, cause they offer very little from an hobbystic point of view (personal opinion). since i don't own a lot of bits and i have just started with conversions, i don't know if painting 16 warriors will be the end of my painting progress (already happened in the past). 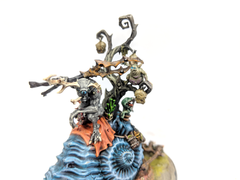 however i am really interested in trying out a new force, a mixed one, that i would enjoy more painting: i really like plaguebearers and plague drones, i have built a daemon prince on my own (that i think is quite good, based on a talos, with blightkings bits and other stuffs). 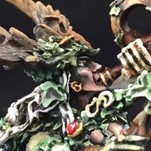 the question is: "can a nurgle army, including blightkings and some daemons, be competitive at 2000, maybe basing itself on the tallyband formation?"  i made a quick list, not perfect and not complete, but at least is a beginning: leaders: GUO 240 daemon prince 160 Battleline 20 plaguebearers 200 2*10 plaguebearers 2*100 Units 10 Blightkings 360 2*3 plague drones 440 this is a start (only 1600 points) but if u could help me in this challenge, maybe i won't have to stop painting (i hope ^^) sorry if my english wasn't enough correct, and ty for the replies! 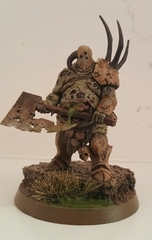 My Nurgle Lord of Plagues for my upcoming Nurgle warband. I am starting a GAC Nurgle army and I'd like to mix the composition between Daemons and Mortals. I have about 19 Plaguebearers, and a Great Unclean One. I have a Start Collecting Slaves to Darkness on order. I'm just wondering what direction I should be looking at going in terms of future army composition and using synergies. Any suggestions would be welcome! Thanks! For the Budget of Sigmar 2 painting challenge I need to do a character and a unit. The unit is going to be my three beasts of nurgle, which are converted and undercoated now. For the character I have my Plague Lord, which was an older model that I have rebased to fit in with the theme of the army. 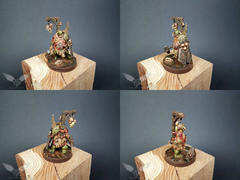 Its converted from the excellent Nurgle Lord kit and the Nurgle Herald kit from the Demon range. Hi guys, I'm building up a Chaos force for an escalation league, after initially deciding on Tzeentch I've backtracked, repainted and gone for Nurgle as I feel the models are cooler, the synergy is a bit more exciting and painting the models is more enjoyable. So far we're only up to 700 points, which for me looks like this: Sorcerer Lord - 140 points 10x Chaos Warriors w/ hand weapons and shields - 180 points 10x Plaguebearers - 100 points 5x Chaos Knights w/ glaives - 200 points The plan is to have a healthy mix of daemons and mortals to where the list looks a bit like this (see attached). 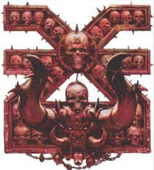 The Daemon Prince will support the daemons allowing them to trigger their 'hero within 7"' abilities. The herald will do the same job (why is there no herald on plague drone?) and just act as a reasonably tanky hero for objectives. The knights will be pointed at squishy units and with DE from the sorcerer hopefully wipe them off reasonably quickly allowing them to then charge again early on to utilise the benefits of glaives on the charge. 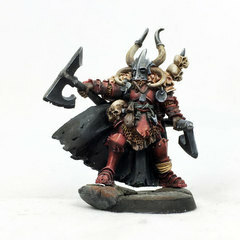 I feel like Chaos Warriors are a really strong battleline, and I like the idea of giving them rending weapons, but can't really justify any more points on them for more numbers. The plaguebearers at 20 strong is still a pretty small unit but again I'm not sure I can justifying the points necessary to bolster them. 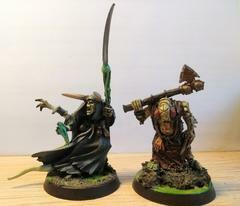 I figure the plaguebearers will be for objectives primarily whilst the CW's will try to get work done. The plague drones, other than just looking bombass, will be the fast movers that can hopefully snipe weaker characters/objectives. I'm umming and ahhing on the Harbinger and Rotbringer sorcerer, the RS is my mystic shield provider, whilst also being cheap enough and tanky enough to be left in deployment on objectives if need be. The Harbinger seems to be a reasonable choice for general, the command ability is quite nice for the mortals, and he's reasonably mobile. At the moment I've doubled up on a unit of Blight Kings, though I've seen mixed reviews on them, because a) rule of cool & b) whilst they might not have huge damage output they can do a decent number of wounds, tank some hits and just generally distract from some of the weaker but potentially more useful units that will be going for objectives. What do you guys think? I'm a bit disappointed in the Nurgle daemon range, especially since I can't bloody stand any of the GUO models available (it's taken me long enough to warm to the Daemon Prince). But although this list was never made to be hugely competitive I feel like I'm ticking enough boxes at the moment. Does anyone have any suggestions for more useful/fun to play units to swap in? 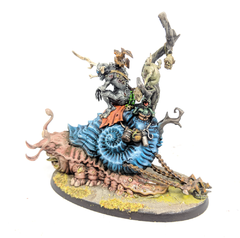 I do own a Plagueclaw, which if I painted up could replace 5 Blightkings, but I'm so loathe to add just one unit of Skaven seemingly from nowhere (even if the models are switched for Nurglings the keyword stays the same).